Despite building the ambitious Emeryville Center of Community Life campus two years ago, a bond funded whole new campus that school district officials had widely touted as a fail safe remedy for perennially sagging student enrollment figures, newly released enrollment data at Emery Unified School District reveals that the district is having ongoing troubles attracting children. Year two into the ECCL era, the gleaming new school campus has shown little to no effect on raising the perniciously dropping student enrollment. In fact, the numbers show it's gotten worse; the district is in a multi-year general downward trend that's culminated in 698 students enrolled in 2015/16, the year before taxpayers built the new $75 million campus, dropping to 687 for the first year at ECCL followed by slight uptick this year at 692, but still lower than before the ECCL. Emery has been plagued with poor leadership; a series of failing superintendents cycling through every three or so years, resulting in plunging test scores and a dropped ranking, landing the beleaguered little district at the bottom among East Bay school districts as the Tattler reported October 8th. Also discouraging for district officials is the consistently low numbers of Emeryville residents with children who attend Emery schools. Last year 46% of children at Emery resided in Emeryville, a number that has remained stuck below 50% for years. 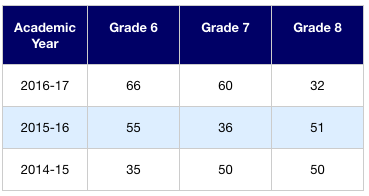 The School Board plans a big turn around for Emery in the form of a new set of guidelines for the District that includes bumping up enrollment including the ratio of Emeryville residents attending Emery, dramatically increasing teacher retention and a big increase in test scores. Board member Cruz Vargas drafted the new guidelines that he forwarded to the Board at a recent meeting but he didn't say how the new goals would be met. The Board has not yet voted on the new guidelines. School districts receive money based on the number of students enrolled and the continuing drop for Emery has had a deleterious effect on the budget, resulting in cut backs over the years. Superintendent John Rubio didn't return calls regarding Emery's newly released dropping enrollment numbers. CORRECTION 10/24 8:35 am: The School Board did not vote on the new guidelines as reported. The story has since been updated. for the enrollment increase. It off set the high school drop. number which could be as low as 30.
now there are 43 students in that cohort. I keep hoping that the Tattler's watchful eye over our school district's actions and results would eventually lead the district to act more wisely. So far, the district doesn't seem to have wised up, but thank you for not giving up. Getting the word out is a great service to our community. Thank you for the encouraging words Will. You bring up the prospect of Emery acting wisely for any reason, at least such as could come under pressure from the Tattler perhaps. That's a good thing to hope for...a public entity acting wisely. Teaser alert: as it turns out, you'll get your answer soon. Watch for a Tattler story addressing this very subject coming soon featuring Superintendent Rubio weighing in on the Tattler and other critics. The story, still in the works, reveals just how wise our superintendent is. if any, and we let the wisdom of fools prevail. Now look where we are. It's absolutely shameful. Cruz Vargas is full of s**t. His plans to turn the numbers around by ordering a new directive sounds like the BS that it is. Totally clueless. What a politician he is- and I don't mean that affectionately. I can just see his reelection campaign literature now. Pledge of Allegiance is Back at Emery!